In 2015, WIPB introduced Be My Neighbor Day, a free event designed to foster a love of helping others in young children. In 2016, The Community Foundation supported the event with a $2,500 grant. 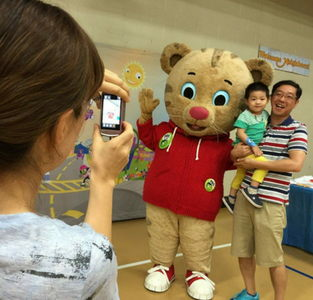 The event was inspired by PBS Kid’s show Daniel Tiger’s Neighborhood and included activities to support the neighborly skills that the show teaches. Originally planned for Canan Commons, more than 1,000 children (with their adults) attended the event which moved inside to the gym at the downtown YMCA on a rainy Saturday. Children and their parents visited with costumed characters, including Daniel Tiger himself, took part in hands-on activities at booths managed by community partners, enjoyed kid-focused entertainment, and walked away with tote bags, books, coloring pages and more. This event will continue in 2017. The Community Foundation is once again supporting the event with a $3,000 grant. This years Be My Neighbor Day will be held Saturday, September 16 from 1 to 4 at Canan Commons.